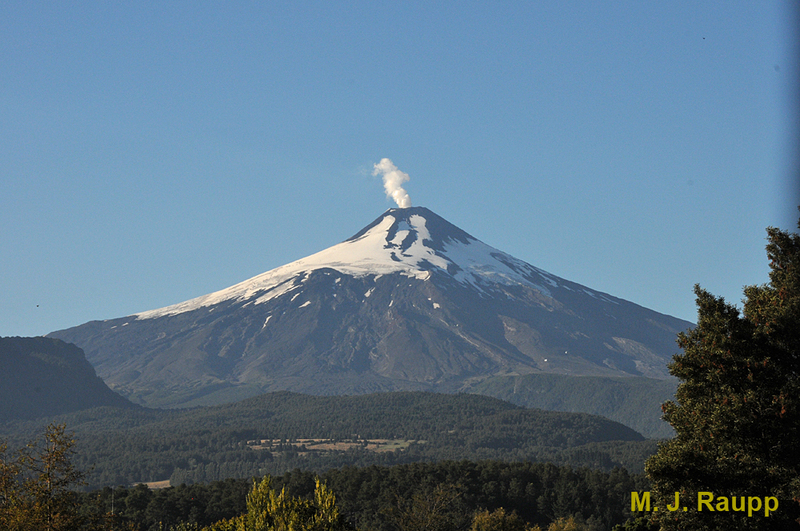 The chinchemolle lives on the slopes of the Villarrica vulcano in Chile. This week, Bug of the Week leaves the balmy warmth of Australia where we visited green tree ants, nozzle-headed termites, orchid beetles, jewel bugs and matchstick grasshoppers. But before returning to North America and the return of spring there, a strange twist of fate found us at the base of the Villarrica volcano near Pucón, Chile. In a Jurassic Park like setting, ancient Gondwanian trees such as Nothofagus and Araucaria clung to the hillsides. 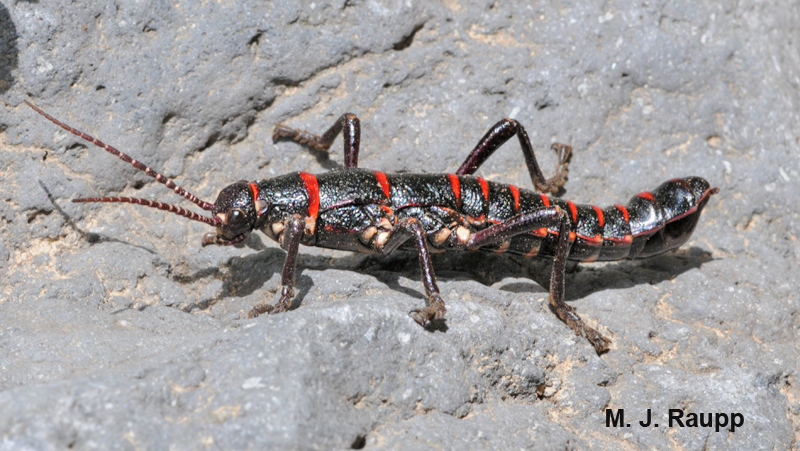 Here along a rushing river at the base of the volcano we discovered the giant phasmatid locally known as the chinchemolle unabashedly grazing on clover and other herbaceous plants lining the stream bank. A beautiful female phasmatid grazes on herbaceous plants near a stream. This monster of the insect world is close kin to another phasmatid, the Twostriped Walkingstick, Anisomorpha buprestoides (Bug of the Week January 14, 2013). The striking adult male walkingstick bedazzles onlookers with brilliant scarlet bands encircling its jet black body. White splotches at the leg joints complete a “look” designed to catch a vertebrate’s attention. The female chinchemolle, while more subtly adorned, is also striking in appearance with her army green body ringed with orange bands. While most other members of the walkingstick clan try to avoid predators by mimicking plant parts and moving very slowly, these brightly colored active ground dwellers have another trick up their sleeve, or should we say behind their head? This male chinchemolle makes no attempt to hide as he moves across the rocky shore. The first segment of the thorax bears two openings leading to large secretory glands just beneath the exoskeleton of the insect. These glands produce a highly irritating, noxious ketone that can be squirted into the face of an attacking bird, lizard, or mammal. In fact, there are reports of serious eye injury to humans who looked just a little too closely at the chinchemolle’s cousin, the Twostriped Walkingstick, and were rewarded with a squirt in the face. One scientific report declares that local residents of Chile know better than to challenge the chinchemolle to a stare-down, lest they experience the peril of pain and temporary blindness. However, a bug geek from North American could not resist handling the chinchemolle and when I stared into the eye of the large phasmatid, it only stared back. If I wasn’t certain that insects lack eyelids, I could have sworn that it gave me a wink. Tender leaves make a fine meal for the male chinchemolle. Notice the opening to the secretory gland behind its head. This is where the defense fluid is discharged. Bug of the Week thanks Dr. Audrey Grez of the University of Chile for identifying the chincemolle and providing the inspiration for this episode. The following references were used in preparation of this episode: “4-Methyl-1-hepten-3-one, the Defensive Compound from Agathemera elegans (Philippi) (Phasmatidae) Insecta” by Guillermo Schmeda-Hirschmann and “Defensive spray of a phasmid insect” by Thomas Eisner.